On August 23, 2013, Sean Boushie met with Officer E. Smith at the Missoula Police Department and told him that Bill Windsor gets paid to harass people. This false police statement is evidence that caused Bill Windsor to be standing trial for five alleged crimes. “Mr. Boushie said that his father was one of the Freeman who were arrested in Eureka many years ago, and his father hired a woman named Cathie (Crystal) Cox to harass Mr. Boushie following his arrest. Ms. Cox engaged in similar harassing behavior with phone calls and frivolous legal filings against Mr. Boushie. 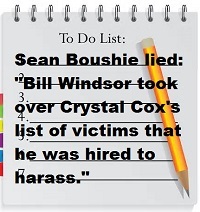 When she passed away, he believes that Mr. Windsor took over her list of victims, or people she was hired to harass. He only found out that she was hired to do this when they reviewed his father's bank statements, in which numerous monthly payments were made to Ms. Cox from his father's account. He told me that Ms. Cox's method was to file frivolous legal claims against people - as the Freeman were known to do - and force people to essentially provide a financial settlement with her to basically make her go away. According to Mr. B**shie, she was said to have amassed an estate estimated at $6 million from this action." This is quite false. Mr. B**shie's father was not arrested as a Freeman; that was his father-in-law, Paul Stramer. Crystal Cox is alive and well. She has just provided a 96-page affidavit in this case. Mr. B**shie's father never paid Crystal Cox for any such thing. Bill Windsor has never taken over any list of victims, has no victims, and has never been paid to do anything to anyone. "This report claimed that I, Crystal Cox had passed away and that Bill Windsor had got some sort of alleged victims list, allegedly of mine. Clearly not factual. "The report also claimed that I received money from some alleged bank statements allegedly from Sean’s father, of which is also easily proven as false. "Officer Smith did not do any investigation into the judicial record of facts on this matter, regarding Sean B**shie being the stalker, the abuser and NOT the VICTIM. "Officer Smith did not research any evidence as filed by Bill Windsor or myself with the Missoula Police, the University of Montana Police, Hamilton Police, Eureka Police and multiple Montana Judges, to easily prove this as fact. "I, Crystal Cox, named in this report and having provable information as to the facts of the case, and also having my own report with Detective Jamie Merifield of the Missoula Police Department regarding Sean B**shie stalking me and threatening to kill me in 2009, was not contacted or interviewed by the Missoula Police Department nor the University of Montana police or attorneys or the Missoula County Attorney. "Most likely because the Missoula Police Department believed I had “passed away” and did not research this easy to find, well known information. As I was, by then in national media around the world regarding my blogs reporting on corruption. "This malicious, willful, wanton defamatory, false police report was taken as truth, with no real investigation into the facts of the case. And has caused irreparable harm to Sean B**shie’s victims such as Bill Windsor, Mary Deneen, Michael Spreadbury and me, Crystal Cox. "The Missoula Police Department and the University of Montana could have prevented Bill Windsor and his company, family and associates as well as Mary Deneen from being maliciously attacked by Sean B**shie and having their lives ruined and under constant duress, however, the Missoula Police Department and the University of Montana did not take any of this serious just as they do not regarding other stalking complaint and rapes. The facts are easily found but they did not bother. "This report, as seen in Exhibit 11, is full of verifiably false statement by Sean B**shie to officer Ethan Smith. One of these is claims that I, Crystal Cox had passed away, that I had some alleged victims list of people who allegedly pay me, and that there was some alleged bank statements proving that I had been paid by Sean B**shie’s father to harass Sean B**shie. All of this is easily verified as FALSE. " This never happened, and there is no evidence that it did. This is a complete fabrication. This one is simple. Ask Sean B**shie to produce evidence to support these statements. 1. Require Sean B**shie to provide evidence.